Follow a red brick and stone path from a shared driveway off Route 33, or Wilton Road, to one of the most affordable home-owning opportunities in Westport. 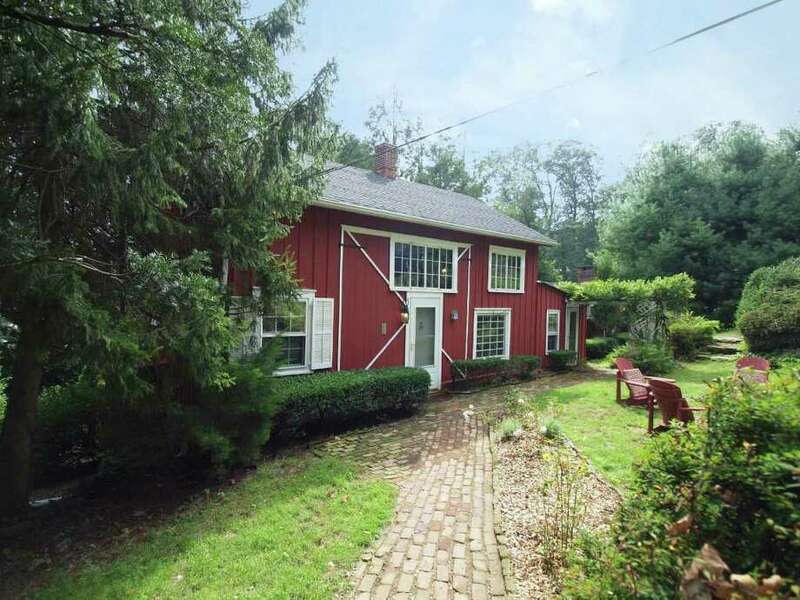 Hidden behind a stand of trees at 211 Wilton Road is a red antique converted barn trimmed in white that is on the market for $465,000, making it a good starter home for the town known more for its multi-million dollar listings. The barn was built in 1823 and some features of the structure hints at its agricultural past. As a home, it has only four rooms and 1,681 square feet of living space, and while that may sound quite small by today's standards, especially compared to new home construction of 5,000 square feet and more, it really is adequate -- and charming too. It is also convenient. The location of the house makes it walking distance to downtown Westport and a short ride to the Merritt Parkway. It is also not far from Route 1, or Post Road, the Saugatuck train station and I-95. Although there is currently only one bedroom, the septic system can accommodate three bedrooms. This house really needs to be seen to be believed. Looking at the home from the outside, it appears smaller than it really is. It has a flexible floor plan and lots of potential. The front entrance opens into an open room that includes the formal dining room and kitchen. Both are separated by a red brick column and a counter topped in ceramic tile, which creates a pass-through to the dining room as well as a breakfast bar. The kitchen could use some updating but, despite its smaller size, it is wider than a galley kitchen and it is arranged in such a way that provides ease of movement and function. There is an eat-in area, a stainless sink, and a tall, thin spice and herb cabinet. Some of the walls and ceilings are covered in a white stucco finish. There are exposed beams throughout the house. The random-width floors are pegged and the walls are paneled wood. Off the kitchen is a long, narrow room with built-in bookshelves that would work as an office or den. This room, like many areas throughout the house, has several nooks, crannies, cupboards, and closets. On the opposite side of the kitchen is a walk-in pantry that also doubles as the laundry room. From there, a vestibule leads to a side entrance as well as a sizable living room, which has a red brick fireplace and a cathedral ceiling. This area of the house has a newly-tiled full bath with an old-fashioned cast iron tub with claw feet. The tile resembles slate. The side entrance has a red brick path and a trellis covered in wisteria vines, which will provide an explosion of lavender blossoms each spring. The bedroom is located in the former hay loft. It has open areas that look down into the dining room. It also has three closets, a cupboard, and a full bath with the same tile as that in the first-floor bath. The nearly half-acre property combines areas that are sloped and level. The flat front yard is elevated. Then there is an area that would make an attractive rock garden as it slopes down to the house, which sits on level ground. The front of the house is bordered with a row of boxwood shrubs. The secluded setting includes stone borders around some flower beds and a host of perennial plantings including hydrangea, azalea, fern, hosta, rhododendron and English ivy. For more information, or to set up an appointment to see the house, call Sandy Ruta or Marina Leo of Ruta-Leo Associates, which is affiliated with the Higgins Group, at 203-291-7675 or email them at rutaleo@higginsgroup.com.